As the son of a well-known composer and organist, he was still only fourteen when he followed in the family tradition and became organist at San Martino in Lucca, but, far from confining himself to organ music, he soon evinced an interest in the orchestra, completing his Preludio Sinfonico in 1876. 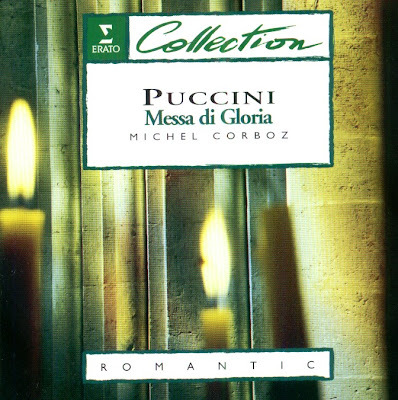 Rediscovered more than a century later thanks to the researches of Pietro Spada, this brief prelude already attests to Puccini's remarkable skill in handling orchestral forces, a skill that was to be confirmed in 1880 with his much more ambitious Messa di Gloria. Intended as his final exercise at the Instituto Musicale Pacini, this work already finds the young composer developing a wholly unmistakable style of his own. The mass in A flat major is distinguished by the beauty of its vocal writing and by a heart-warming lyricism underscored by extremely inventive instrumentation. Although the Mass remained unpublished, Puccini was clearly sufficiently proud of the piece to reuse certain of its themes: the Agnus Dei is reused more or less in identical form in the opera Manon Lescaut. The Capriccio Sinfonico - written in 1883 at the end of his period of study at Milan Conservatory - contain a number of themes that listerners can identify in La Bohème. The Compact Disc was released by ERATO, 1978/1996, (ADD). ERATO 0630-12818-2.